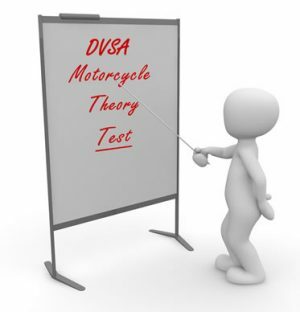 The information contained on this page will guide you through the most frequently asked questions for the motorcycle theory test. From February 2001, anyone wishing to ride a motorcycle on public roads must take a theory test. The motorcycle theory test is divided into two section, the multiple choice and hazard perception part. The first multiple choice section will last for a maximum of 57 minutes though you may answer questions quickly resulting in a reduced time. It will involve you needing to answer 50 multiple choice questions, where the pass mark is 43 correct answers. Many of the questions will require one answer though some may require two or more answers. You may ‘flag’ questions if you’re unsure of the answer and come back to them later if you wish. For the hazard perception section, you will be shown 14 video clips, all of which will take 30 minutes to complete. These clips involve typical road driving / riding scenes where there’ll be at least one developing hazard per each clip. During one of the clips, there will be two developing hazards. You’ll need to respond to a developing hazard as soon as you notice it by clicking the mouse button anywhere on the screen. If you recognize the hazard in good time, the maximum score you’ll receive is 5 points per clip, except for one of the clips where two hazards are presented resulting in a possible 10 points. Points are reduced the longer you take. The pass mark for the car and motorcycle hazard perception part is 44 out of a maximum 75 points. Is the motorcycle Theory Test The Same as for Cars? The motorcycle theory test is different from the car theory test. Around ninety percent of the questions on the multiple choice part are the same, though ten percent are specifically related to motorcycles. The hazard perception section remains the same as the car version. I Have Passed the Theory Test for Cars, Do I Still Need to Take the Motorcycle Theory Test? If you have passed the theory test for cars, you’ll still need to take and pass the motorcycle theory test. What do I need to take a motorcycle theory test? Age 16 – Moped (category AM new licence category, category P old licence category) riders are limited to a 50 cc scooter and no faster than 45 km/h (28 mph). A CBT (compulsory basic training) certificate is required first. Age 17 – Motorcycle (category A1) riders can upgrade to a 125 cc machine with a maximum power of 11kW. (14.6 bhp) manual or automatic. A CBT certificate is required first. Age 19 -You can take the A2 practical test for a full licence limited to 35 kW (46.6 bhp) and a maximum cubic capacity of 395 cc, or A1 which is taken on a machine of less than 120 cc (this will restrict you to a 125 but no L-Plates). A CBT certificate and Motorcycle Theory Test is required first. Age 21 with an A2 licence held for 2 years – You are able to take the full A licence (taken on a bike that produces at least 40 kW or 53.6 bhp). Age 24+ -You can take the category A practical test for a full licence (taken on a bike that produces at least 40 kW or 53.6 bhp). A CBT certificate and Motorcycle Theory Test pass is required first. I have a provisional licence to ride, what now? Before you can legally ride on the road, you’ll need to complete compulsory basic training (CBT). CBT lasts for two years. Within this two years you’ll need to pass the practical test to obtain a full licence. If this is not completed within the two years, you’ll need to take CBT again. Does the motorcycle theory test need to be completed before CBT? You do not need to have completed the theory test before taking CBT. CBT simply qualifies you as a learner for a two year period. You will need to have taken and passed the motorcycle theory test before you’re able to take a full motorcycle practical test.